making these I kept thinking of peanut butter stuffed Oreos, not sure why though, I guess because it has the same flavors. 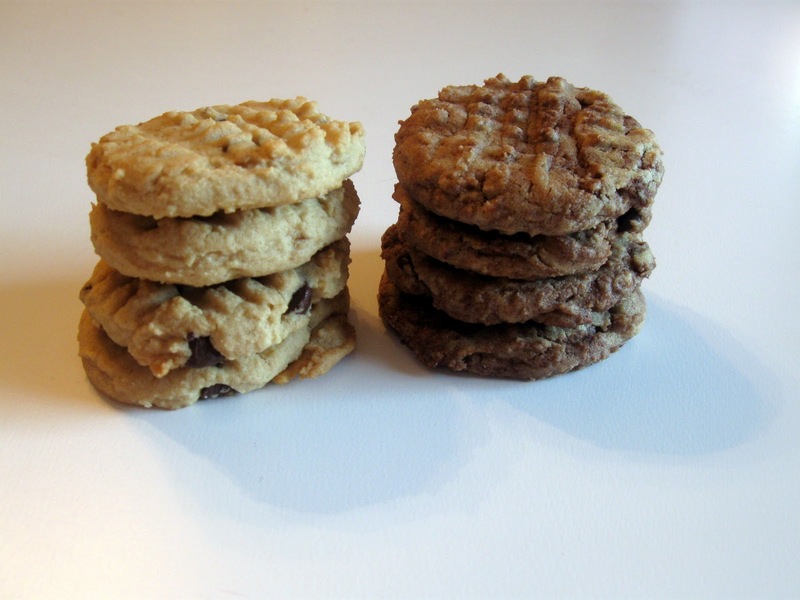 I'm usually not a huge fan of peanut butter cookies although I really like peanut butter. I believe it's because they tend to be crumbly. I baked these about 10 minutes and they came out soft and chewy on the inside which is how I like my cookies. 1. Combine butter, peanut butter, sugars, and vanilla. Blend together until fluffy. 2. Add egg, mix until combined. 3. Add flour, baking soda and salt with mixer. 4. Add chocolate chips and mix until blended. 5. Scoop half of dough onto baking sheets using a cookie scoop or rolling the dough with your hands. 6. Mix 2 tablespoons of cocoa into the rest of the dough in the mixing bowl until the dough is swirled. Add 1-2 tablespoons of milk if necessary to achieve a proper consistency. Scoop onto baking pans using a cookie scoop. 7. Using a fork, press down the balls and create a criss cross pattern. 8. Bake in a preheated 350 degrees F (175 degrees C) oven until edges very lightly browning (about 7 to 10 minutes). Don't overcook. We store them in a plastic storage containers, and they stay soft! Apple Pie Stuffed Spice Cookies...and a GIVEAWAY!